I’m a sucker for chips, guacamole and salsa. I’m also a sucker for races that I’ve never run—as if the Ravenswood Run was any indication. Combine these two factors and the Cinco de Miler on Sunday, May 6, sounds like my ideal race. That would probably explain why I signed up for it months ago—and up until about a week ago I thought that the race was actually on May 5, the true Cinco de Mayo. Oops! But at least now I know I won’t be showing up at Montrose Beach on Saturday morning wondering why I’m not hearing tunes from the El Guapo band, smelling the breakfast burritos and churros that await runners at the finish line, seeing the piñatas that can be cracked for charity, or fighting the typical traffic that occurs at the Wilson lot before races. Those are just parts of the post-race fiesta, minus that traffic situation I fear, that follows the five-mile race. There’s beer, each runner gets a cerveza on the house, and chips and salsa, the perfect complement to the margaritas consumed on Saturday. But all these perks, including the Fun Fact Friday emails full of trivia about the race’s namesake holiday and its charity and its sponsors, are bonus points in my book. 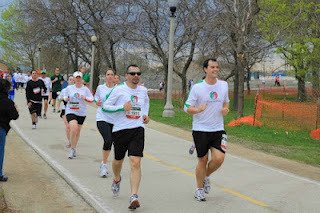 I’m now seeking revenge on the Bank of America Shamrock Shuffle, not the race itself, but how I ran it (holding on for dear life in the final mile and chugging ever so slowly over the Roosevelt bridge that shouldn’t have felt as painful as it did). Only problem is that seemed like a smart idea more than a month ago when I logged more track workouts rather than sleeping through them or attempting, and failing, to bang them out on the treadmill because I wasn’t keen on the weather outside. The cold and the rain will do that to me. Back to the race itself—you didn’t really want to listen to me whine repeatedly, did you? This second-year race sounds like quite the runner’s Cinco de Mayo celebration. Age group winners go home with sombreros. Runners can take a whack at a piñata—for $2 you get 30 seconds to bash the candy out of a piñata, claim a prize, and know that RAM Racing will match the total amount collected and donate to Chicago Run. The post-race food takes a Mexican spin, even down to the Modelo Especial beer. And like other RAM races—Terrapin 5K, Bucktown 5K, and Hot Chocolate 15K/5K—runners score another cool wearable to add to the collection. All convincing factors for this runner—and knowing that there’s a laundry list of events happening around the country this weekend from triathlons to marathons and everything in between (no joke). For more details on the Cinco de Miler or to sign up, click here. Now who’s ready to run on Sunday? Update: Check out more details on Sunday’s Cinco de Miler at The Rundown.